Opening hours of the Mount Teide cable car are usually from 9am to 5pm. In summer, the cable car operates until 6pm. In summer, when the peak season is, best times for avoiding crowds are before 10am and after 1pm. We are comparing Tenerife Mount Teide Cable Car Fast Track Ticket Prices from leading ticket suppliers and Try to find you Cheap tickets prices on the market. 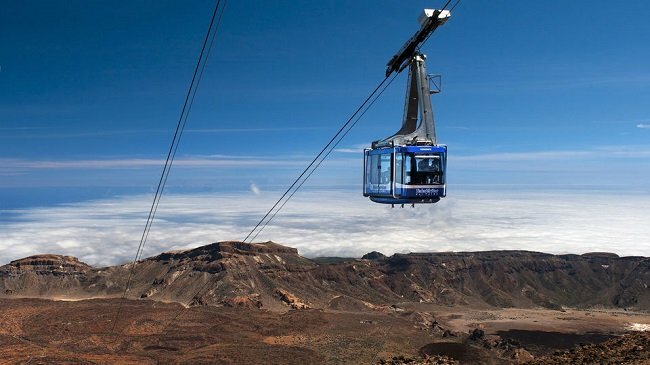 The "Tenerife: Mount Teide Cable Car Fast Track Ticket" is the package that allows you to skip lines to take a ride to the highest mountain in Spain. The short ride on the cable car takes you over interesting geological formations, lava rivers and varied landscapes. During the Mount Teide cable car ride, vistas of immense beauty offer extraordinary photo opportunities. The upper station is at the height of 3550 meters above the sea level. From there, a few hiking trails lead to different directions, each of them revealing something extraordinary. Depending on the route you choose, you will admire views of the north or the south of Tenerife, or visit the highest top of the volcano. Considering that you don't have health issues and don't suffer from height, you will have a great time during the ride and on Mount Teide. This activity is particularly enjoyable to people who love beautiful nature and to marvelous views. The activity is also ideal for adventurous people. Your Experience With Tenerife Mount Teide Cable Car Fast Track Ticket? You will enjoy a cable car ride over gorgeous landscapes of the Teide National Park. You will have an opportunity to see magnificent volcanic formations of the highest mountain in Spain and the largest national park of the Canary Islands. Once you arrive at the upper station, you have among three walking trails to choose from for a hike. Enjoy spectacular photo opportunities while you are spending time up there. What Tenerife Mount Teide Cable Car Fast Track Ticket Includes? The "Mount Teide Cable Car Fast Track Ticket" entitles you to direct access to the boarding area of the Teide cable car. With this ticket, you will take a round trip to the upper station of Mount Teide, from where you can set off on a hike. The influx of tourists who wish to witness the immense beauty of the National Park of Teide increases significantly in summer. The last ascent of the cable car is at 4pm while the last descent is at 4:50pm. Regardless of the season, take warmer cloth for this activity. Travelers Reviews about Tenerife Mount Teide Cable Car Fast Track Ticket? The overall rating of this activity on Get Your Guide is 4.6 while the tour has the 4 rate (out of 5) on Viator and TripAdvisor. The most common statement about this tour by former participants is that it boasts extraordinary views of the Atlantic and the surrounding. Albeit there were some minor complaints regarding the tour, most travelers enjoyed the experience very much. The cable car to the Mount Teide isn't suitable for people with disabilities. Both mobile and printed tickets are valid for the ride on Mount Teide cable car. Both available providers have the cancellation policy that allows you to get the full refund for timely cancellations. Check weather conditions in advance, especially in winter, because they may affect accessibility to the cable car and cause cancellations. Don't forget to take warm clothes and sunscreens when going to Mount Teide. You should avoid this activity if you suffer from issues related to heart and breathing. You can board the cabin at the cable car base station.